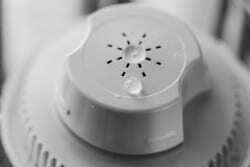 As you may already know, Brita filters are a loose-packed granulated filter. If you know anything about water filtration (which I do), a loose-packed granulated filter is the worst way to filter water. Why? Water will always find the path of least resistance and over time, some of the water will not even touch the filter media. It’s no wonder that Brita is getting such poor results with their standard filter. So, why would Brita use a loose-packed filter system? The answer is easy…they’re very cheap to make. The factory simply pours the loose filter media into a plastic filter casing and then seals the top. You can make thousands of these per hour at a factory in a far away place for pennies. They can make them fast & cheap and customers keep buying them. That leads me to my next statement, why buy a filter that does not filter? Contributed by By Mark, Former Marine Reconnaissance Team Leader, Marine Infantry Officer, Cross Fit Coach, Water Expert, and Survivalist. Do Brita Filters Remove Lead? No. Even though lead isn’t very hard to remove, it’s almost impossible using a loose-packed water filter like the one Brita makes. Brita doesn’t claim to remove lead and it’s simply not something that they’re trying to do. They prefer to make cheap CTO filters (Chlorine, Taste, & Odor) that just change the taste of the water and make it more drinkable. If you want to remove lead from water, you need to get a solid carbon block filter like the one Epic Water Filters or Berkey makes. Solid carbon filters are more expensive to build and cost more to buy, but they’re the best way to remove water contaminants. They force water to take a tortuous path through layer after layer of compressed carbon; like a maze. This leads to a long drain time and more contact time with the filter…this is how they’re able to remove so much more contaminants than loose packed filters. Loose packed filters like Pur, Brita, Invigorated Water, and other cheap ones from China do not remove heavy metal contaminants like lead, mercury, or arsenic. Hell to the no! First of all, why are we still putting fluoride (a neurotoxin) in our water? Some people claim it makes our teeth strong & healthy, but the United States is one of only a handful of modern countries who still add fluoride to their drinking water. Fluoride is really hard to get out of water and with a loose-packed filter (like the one that Brita makes)…forget about it. Only a handful of companies test & try to remove fluoride from water. 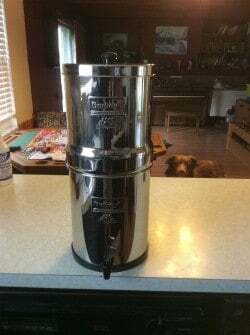 I know that Berkey makes special fluoride filters and Epic Water Filters also tests and removes fluoride in a water pitcher format, but that is about it. You can also remove fluoride by purchasing a reverse osmosis system, but they can be expensive. 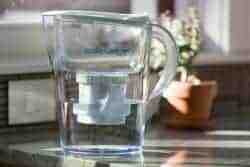 Your standard Brita water pitcher lets fluoride pass right on by. Also, Zerowater, Pur, and Invigorated Water do not remove fluoride at all. Do Brita Filters Remove Microplastics? No. We are still waiting for testing on microplastics as this is a new contaminant which just came to light in 2018. As of right now, no water filter pitcher has been tested for microplastics (to my knowledge), but I will update this article once I found out new information. 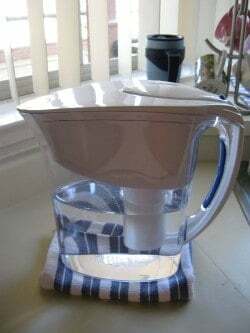 Do Brita Filters Remove Iron? No. I cannot find any testing or claims by Brita that they remove iron from water. So, if you have iron in your water, you might want to look for a solid carbon block filter system. Too much iron in your water can be a health liability. I just checked Epic Water Filters website and they claim to remove 95.2% of iron from water with their water pitcher called the Pure. Again, if you have heavy metals in your water, seek out a solid carbon block filter, it is the best way to go. Do Brita Filters Remove PFC, PFOA, PFOS Perfluorinated Compounds? 100 gallons) was Epic Water Filters. I also found out they have tested all of their filters for this contaminant…even their water bottle filters. I could not find this testing for ZeroWater, Pur, Invigorated Water or Brita. So, if your tap water has perfluorinated compounds in it, you might want to check Epic Water Filters or a Reverse Osmosis System. Do Brita Filters Femove Chloramine? No, I cannot find any testing results or claims that say that Brita filter remove or reduce chloramine from drinking water. If you want something that removes chloramine from water, check out the Epic Smart Shield or a similar product certified to remove chloramines. Do Brita Filters Remove Calcium? No, I cannot find any testing or claims by Brita for calcium removal. I am not surprised by this lack of testing and neither should you. To be fair, calcium is not really considered to be a water contaminant like lead (just more of a nuisance). Do Brita Filters Remove Chromium 6? water, you might want to move. It is estimated that millions of Americans are drinking water contaminated by Chromium 6 and don’t even know it. The Environmental Working Group estimates that by the end of the decade, this contaminant will be responsible for 12,000 excess cancer cases. Again, this could be avoided by simply using a carbon block filter. No. I cannot find any testing or claims regarding this important category of water contamination. The United States alone has a ton of boil water advisories every month for microbiologically unsafe water. Thousands of people get sick every year from ingesting contaminated tap water right here in the United States. I could only find two water filter pitchers that remove these types of water contaminants; Epic Water Filters Nano water pitcher and Clearly Filtered. It looks like the Berkey countertop also removes these contaminants. Again, better to skip Brita if you want to make sure your water is safe to drink. Invest in a solid carbon block system either in a pitcher format like Epic Pure Water Filter Pitcher, under the sink filter format, or a countertop version like a Berkey. This is the only way to really remove water contaminants. In my opinion, stay away from Brita because they’re really not doing anything except changing the taste of your water. In North America, we have a lot of tap water contaminants which can really affect your health. Keep drinking clean water & keep getting more educated on what works!! !